Silhouette ModelMaker™ is an easy-to-use educational software tool for creating 3D shapes and converting them into 2-dimentional images that can be cut out and assembled. This software is perfect for classrooms, but can also be used in a home environment to create a variety of 3D paper crafting applications. Providing STEM (Science, Technology, Engineering, and Math) subject teaching and learning opportunities, ModelMaker is simple enough for elementary age curriculum, yet robust enough to transition into high school and beyond. Models designed in the software's 3D environment are converted instantly into nets (flat version of the models) that can then be cut out with a Silhouette cutting tool, such as the Silhouette CAMEO® or Silhouette Portrait®. Build a rocket ship, design a mock-up for a company product, or create an entire model city. The possibilities are endless! ModelMaker saves and opens in a native file format (.MODEL). Other various file types (such as JPG, PNG, BMP, TIF, and GIF) can also be imported for use in customizing model surfaces. 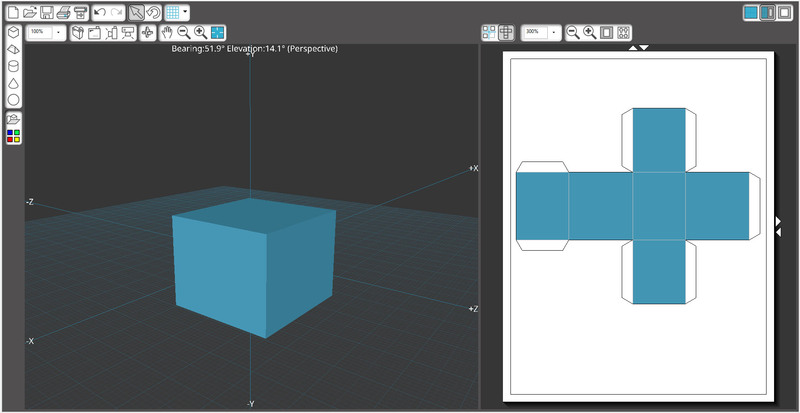 ModelMaker can export both 3D data and nets in the native .MODEL file format, or can export the 3D data only in STL format, or nets only in an SVG format. Supports English plus 24 other languages (Arabic, Bulgarian, Chinese Simplified, Chinese Traditional, Czech, Danish, Dutch, French, German, Hungarian, Indonesian, Italian, Japanese, Korean, Persian, Polish, Portuguese, Russian, Spanish, Swedish, Tagalog, Thai, Turkish, and Vietnamese). Silhouette ModelMaker™ requires a license key to unlock all features. Click here to download a copy of the ModelMaker software manual. Silhouette ModelMaker™ offers both individual user licenses and site licenses for educational facilities to cover multiple computer licensing. Whether you're an school looking to use ModelMaker in your curriculum, or a student who wants to create at home in tandem with lessons from school, or a paper crafter who wants to explore creating 3D paper crafts, we've got a purchase option for you. This is a single-user license. This provides access to the software and further software updates. Great for students who want to create projects at home, or paper crafters who want to explore 3D modeling. Site Licensing offers multiple licenses for schools and other education facilities. This provides access to the software and software updates for all seats. Perfect for teachers and students for an in-class experience to provide fun and engaging hands-on learning of STEM curriculum. * Site license options and pricing available for Education accounts only. $300 starting price listed if for 25 seats. Further options available for larger classrooms, schools, or organizations. To hear what teachers and students are saying about Silhouette ModelMaker™, click here.